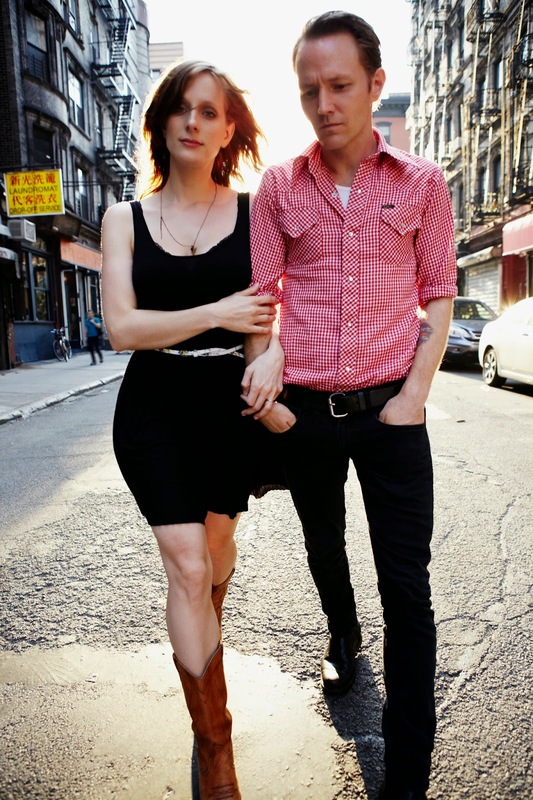 Back in 2012 the debut album of Whitehorse was one of this blog’s formative reviews. So it’s fitting to reflect on how both have grown in the last three years. 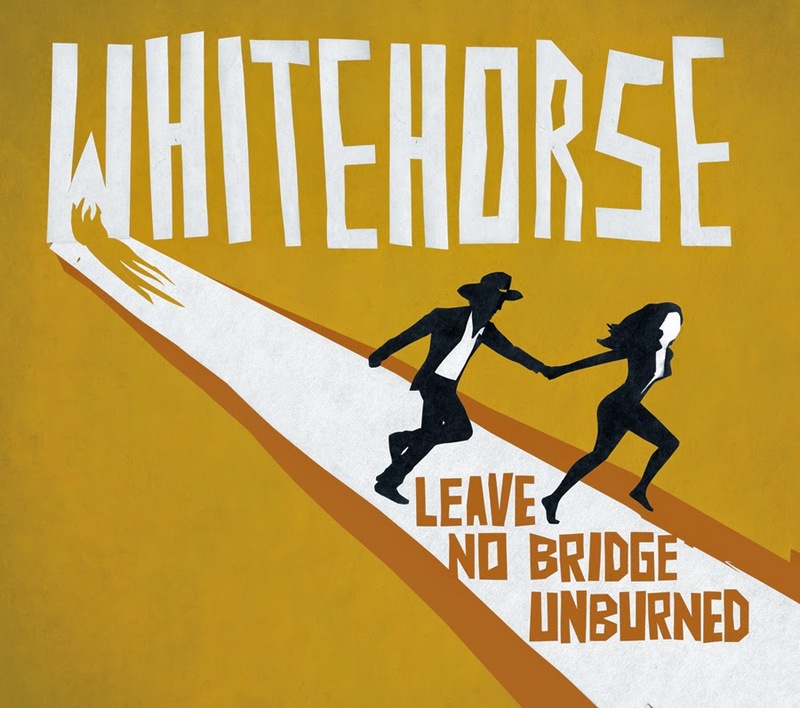 Just as the blog closes in on 400 reviews, the evolution of Whitehorse as a recording entity develops into the making of an album capable of creating shockwaves throughout the Canadian and international community of ultra-creative roots music. LEAVE NO BRIDGE UNBURNED sees husband and wife duo, Luke Doucet and Melissa McClelland, steer their sound in a vamped up direction, underpinning an avalanche of spectacular tunes with a firm rock undercurrent. The sheer immensity of precious tracks make this album an outstanding candidate for national acclaim and it would not be a surprise to see it get a Juno nod. Like every great album, intrinsic qualities surface with each listen but right from the off a trio of outstanding pieces firmly plant the record at the core of your listening sphere. ‘Tame as the Wild Ones’ is a sumptuous waltz-infused tune designed to set your senses alight with a choral melody straight from a melted heart. As the record hurtles towards its forty minute conclusion, a pair of ‘real deal’ high octane rocking tracks launches the album into a stratospheric alt-country heaven. Take your pick between ‘Oh Delores’ and ‘The Walls Have Drunken Ears’, but both see the guitar fully take control with incredible effect. Luke and Melissa participated in effective individual careers prior to forming Whitehorse and have only just let the door open to a multitude of session players after initially driving the duo via their own diverse guitar and percussion skills. Enlisting the production services of Gus Van Go has enabled a fuller sound to develop with the outstanding liaison and chemistry of Luke and Melissa still remaining the core ingredient. Additionally a couple of intense ballads just preceding the rocking finale show the duo at their harmonious best in the gorgeous ‘Dear Irony’ and the passionate ‘Fake your Death (and I’ll Fake Mine)’. Although ingrained members of the Canadian music scene, Luke and Melissa hold a fascination for aspects of the American south and introduce plenty of moody gothic moments especially within the haunting beat of ‘Evangelina’. The album emerges out of a blanket of darkness with the stunning opener ‘Baby What’s Wrong’ showing glimpses that Whitehorse can rise to the level of the great male-female Americana duos, most notably the now no longer active Civil Wars. ‘Sweet Disaster’ sees Melissa lead on an unconventional love song heading straight in Luke’s direction. All songs are original compositions from Luke and Melissa with Gus lending a hand to three of them including the thumping ‘Downtown’ which raises the volume with the injection of some heavy soul and a stint from the farfisa organ. Leaving comments on the excellent two remaining tracks, ‘You Get Older’ and ‘The One I Hurt’, to the end is just a reflection of the sheer high quality of the others, although the former does stand out with a landscape inspiring bass line. In fact they play their part in making this one of the most exhilarating releases of the year so far and one that sets such a high standard in mixing infectious musical marvel with songs crafted to meet the approval of the most discerning ear. Whitehorse’s development as a recording duo in the last few years has been impressive and LEAVE NO BRIDGE UNBURNED is a sonic delight successful in making a lasting impact. This is a record whose enjoyment of will only just commence at the conclusion of this high complimentary rave review.